Lighting is the most important part of interior design. There. I said it. 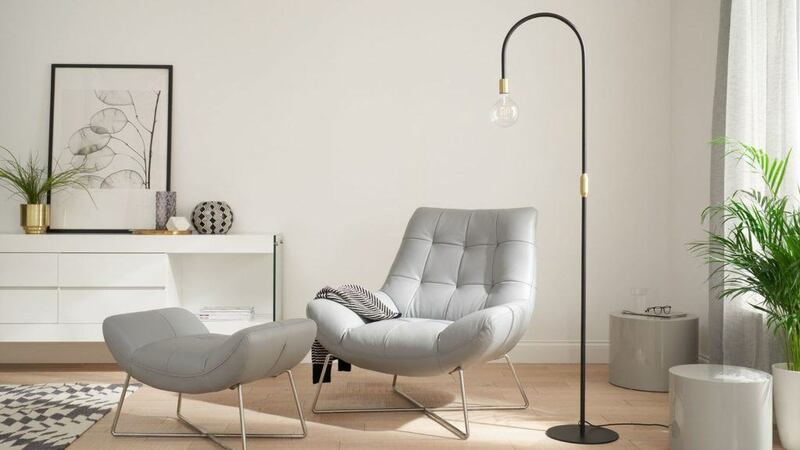 Create an interior statement with the Rey Floor Lamp. You may think this to be a bold and false statement but think about it. You can have the most beautifully decorated room with incredible furniture, but if the light is too dark, or too harsh, the feeling will be totally wrong. 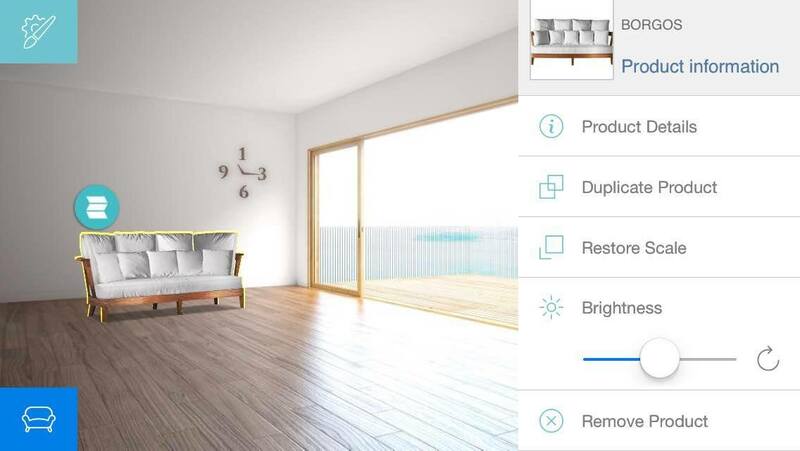 Getting your lightning right should be top of your interior wish list, and we're here to show you just how to create that perfect ambience for every room in your home. 1. What will I use the room for? Knowing how you are going to use a space is key to getting the atmosphere right. 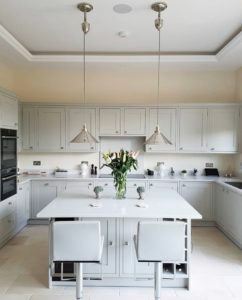 Kitchens generally need bright, overhead task lighting so you can see what you're doing, where as Bedrooms are generally dimmer to promote relaxation. 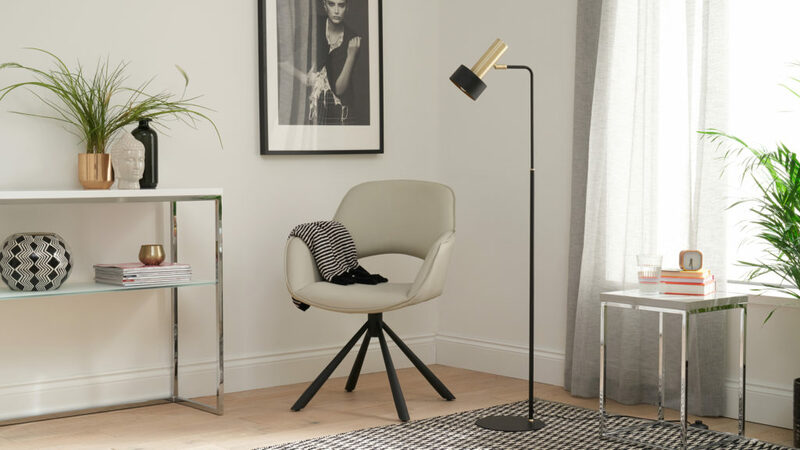 Create a cosy corner in your bedroom or living room with a statement chair and simple lamp, such as the Alma Floor Lamp in Black and Brass. 2. What atmosphere do I want to create? Creating an atmosphere can be as simple as playing with levels of lighting. Think about it- romantic scenes are usually lit with candles and soft lamps. For rooms where you want to relax, unwind or just hang out require soft, warm lighting. Playrooms, on the other hand, are promoting learning, creativity and play, so would require slightly brighter light to see what's going on. The Soft white shade of the Casa Table Lamp offers a beautiful atmosphere for reading nooks or bedrooms. 3. What space do I have? Thinking about space is usually the most overlooked thing when it comes to lighting your home. 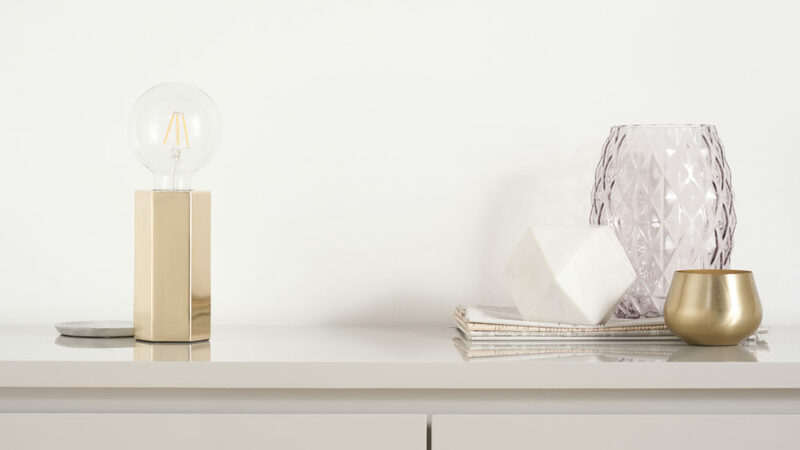 We choose beautiful bedside table lamps which take up all the space on our side tables, or pendant lights which are so low you keep bumping your head! 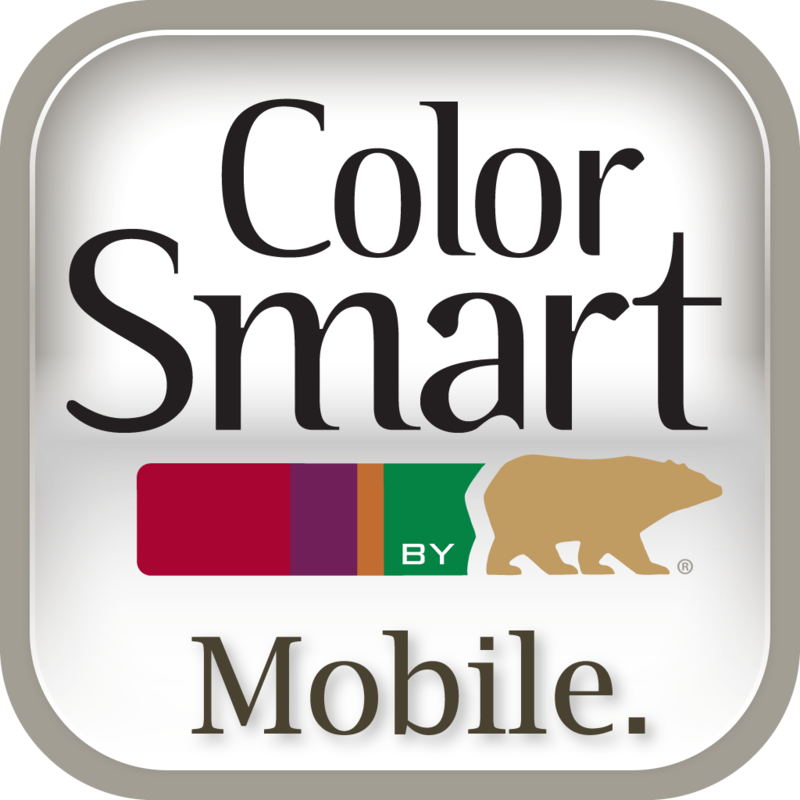 Making sure you have enough room for your chosen lighting should be taken into consideration. 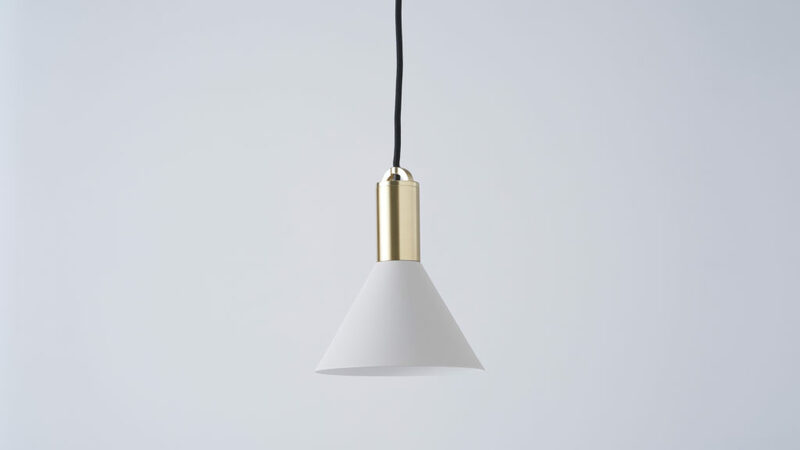 Using the Teo Pendant lights as an alternative to bedside lamps is a great space saving solution. Finally- don't forget your budget! We could all fall in love with a Porta Romana lamp, but no one will be willing to remortgage to have one! Set yourself a budget for your lighting and stick to it. With so many options you're bound to find a designer knock-off or beautiful simple design within your price range. 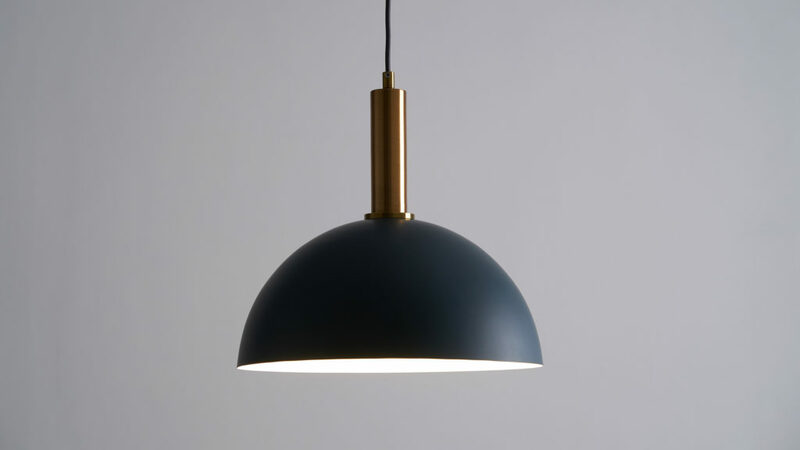 The Olivia Pendant light has just enough style to bring that designer look to your home without overpowering the rest of your surroundings. Now you've worked out exactly what it is you require your light for, let's take a look at a few different styles of lighting. Depending on your personal interior style, there are many options and combinations of lighting styles to create very different looks. 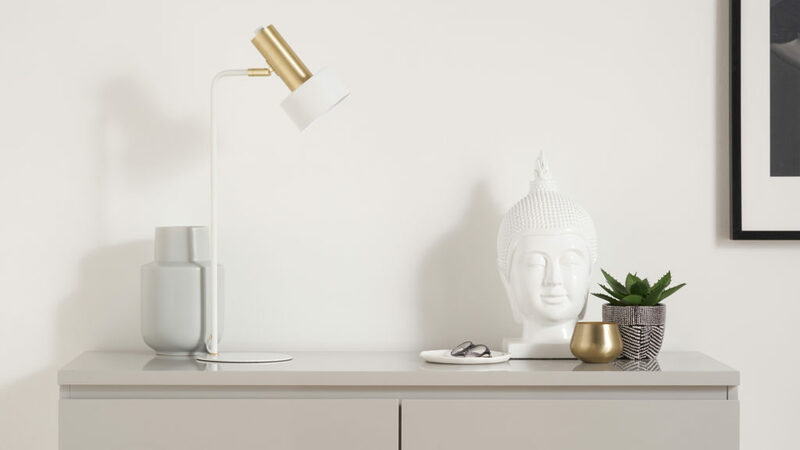 The Haze lamp is an ideal options for desks or bedsides, as you can angle the light exactly where you need it most. Minimalist homes will always be a thing, regardless of what other trends are current. A minimal style is classic, timeless and considered. Everything purchased has more thought put into it and is bought for substance, over style. 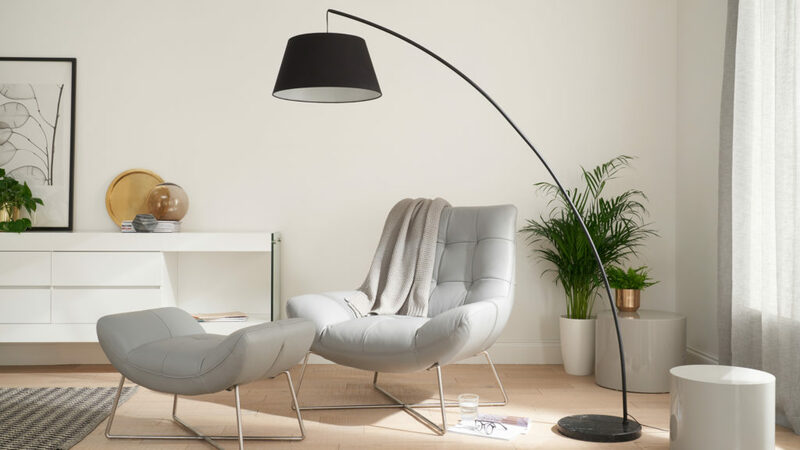 The Carmel Floor Lamp is suited for minimal interiors due to its simple shape and considered design features. 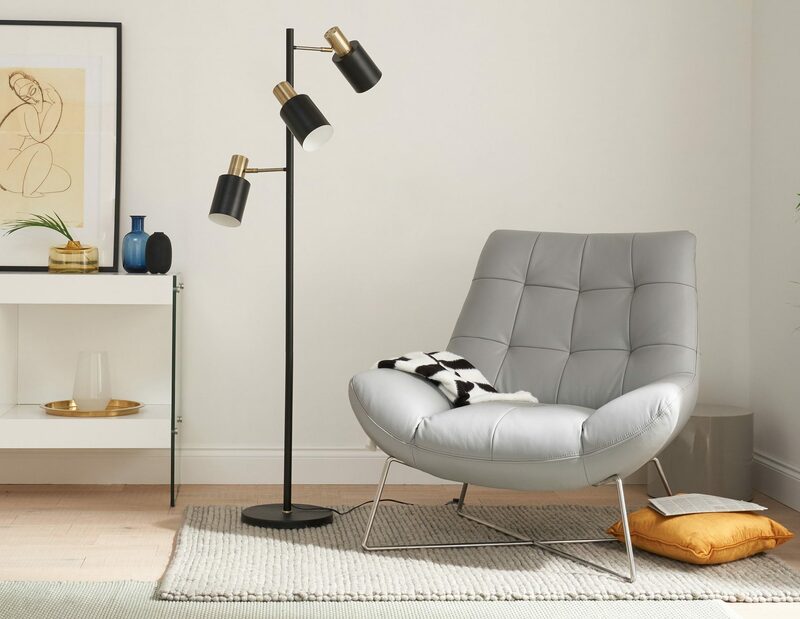 Our Carmel Floor Lamp is the perfect, simple addition to minimalist homes. 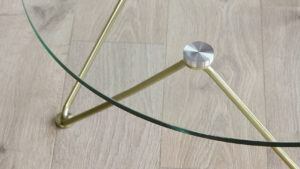 With a smooth arch and subtle brass details, it will sit in any room of your home. Double up and use as statement bedside lamps, or position next to your sofa for a dedicated reading nook. ... especially when paired with the matching Teo Table Lamps. For something smaller, the Teo Pendants and Table Lamps are the perfect pairing for clean kitchens and simple suites. 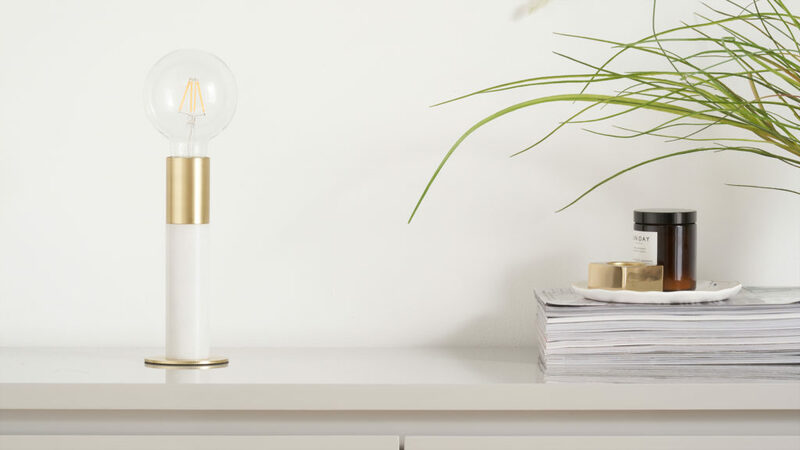 The marble brings a touch of opulence while the brass highlight adds a touch of modern design. For cool, Scandi inspired style, think about simple silhouettes and light colours. White is the go-to choice for Scandinavian interiors, promoting a light and airy atmosphere. 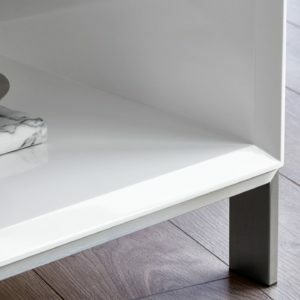 Our Alma range is perfect for this due to the slim profile and clean matt white finish. Pair the Alma lamp with the Fiesta pendant to bring a pop of colour. 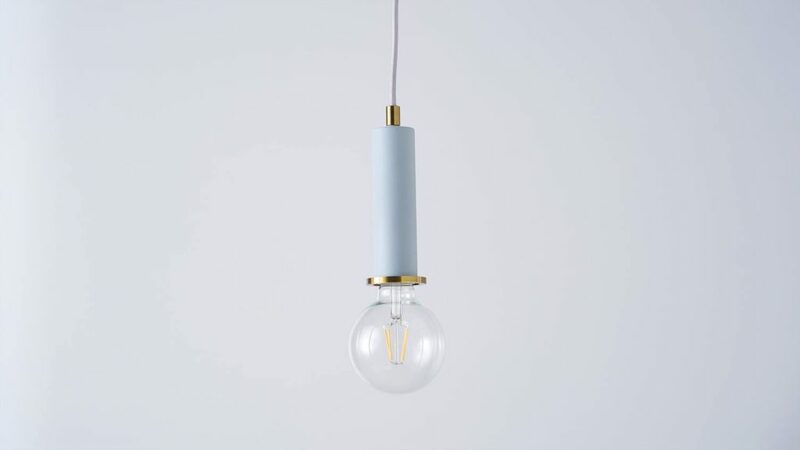 Exposed bulbs are also a key feature of Scandi cool style, so opt for a statement bulb to add your own twist. The Fiesta Pendant in Light Grey adds a subtle pop of colour to your Scandi home. 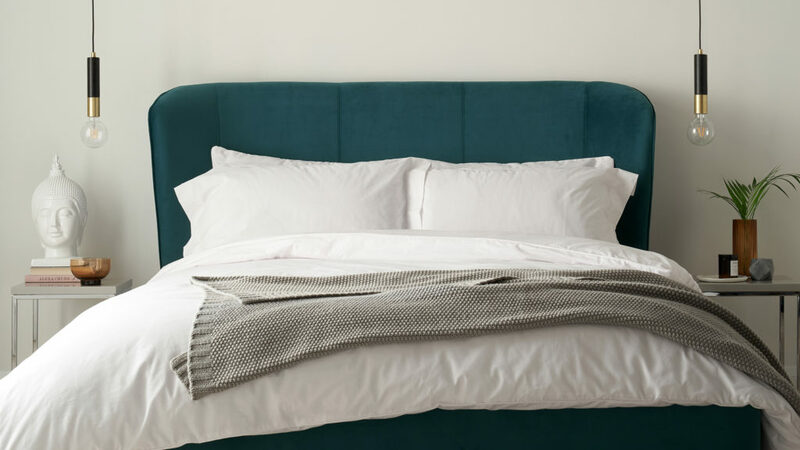 Ever stayed in a luxe boutique hotel and fell in love with the statement lamps and luxurious textures? Creating this look yourself is super easy! Think marble bases, chrome stands and oversized shades and you're there! 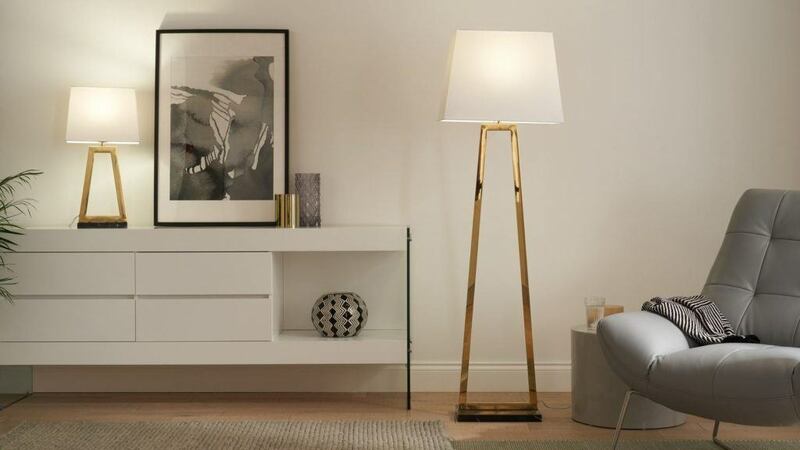 Pair up the Casa Table and Floor Lamps for a boutique statement. The Casa range is ideal for creating a Boutique Luxe style. Position and pair of table lamps either end of a sideboard, or one your bedside tables for a symmetrical look. 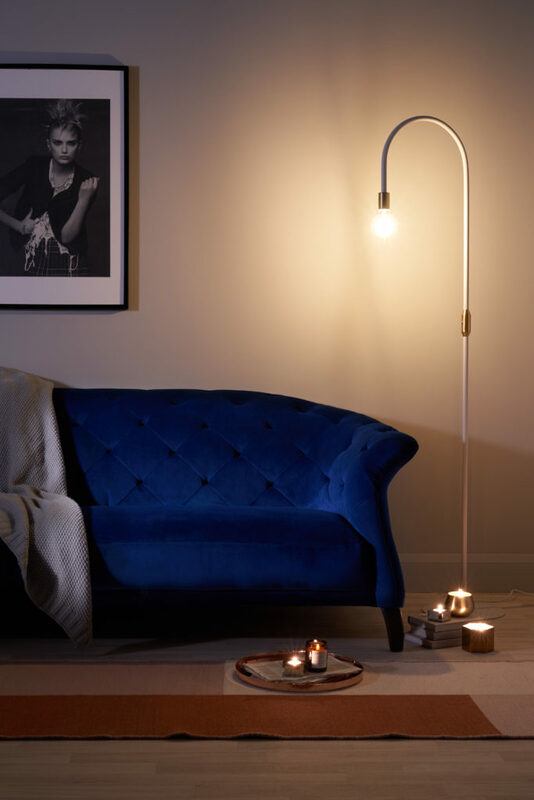 Alternatively, the stand alone floor lamp will add drama and an opulent feel to any living room or hallway. Or use the Casa Table Lamps as bedside lamps for a real style statement. Finally, with space at a premium, we are all trying to squeeze a little bit more into a little bit less. Be savvy with your lighting choices and opt for space saving solutions. 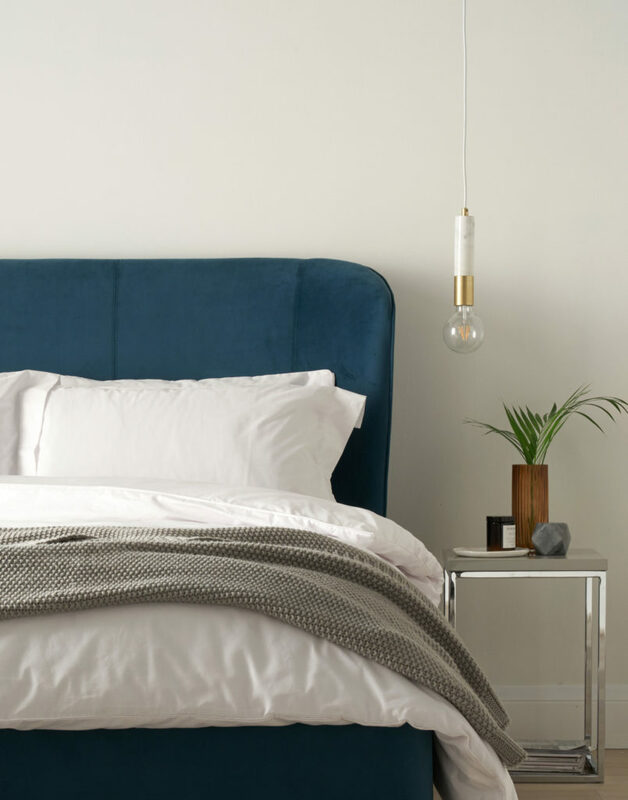 Save space with bedside pendants. Keep your side tables clear and nail interior styling all at once. Play around with pendant lights instead of bedside lamps to keep surfaces clear and create a style statement. 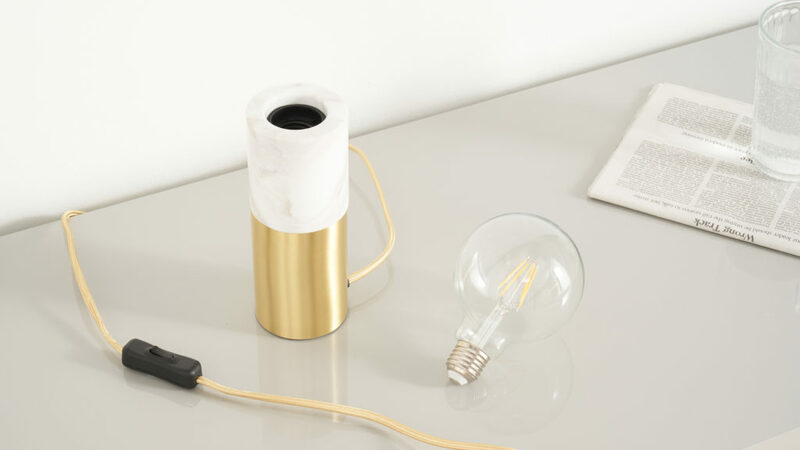 Or maybe choose a compact table lamp which is light and easy to move around if needs be. Compact styles such as the Felix and Pablo are perfect when perched on a stack of books or stand alone on your side tables. 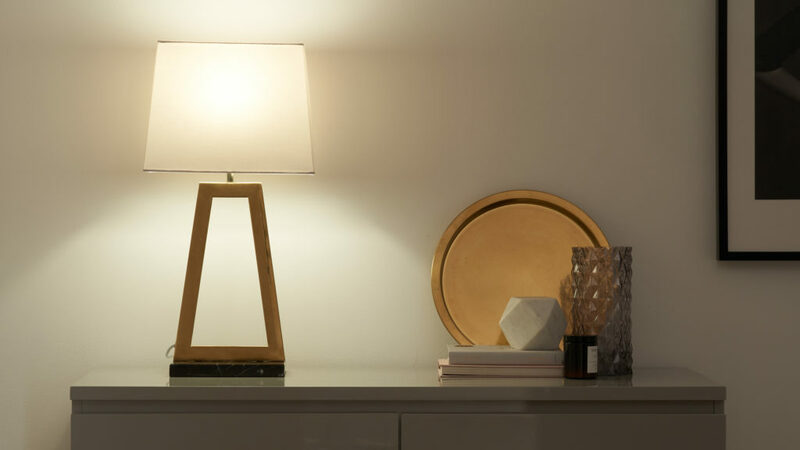 Simple yet effective styling in the form of our Felix Table Lamp. You are now fully clued up on your own interior style and how to use your new Danetti Lamps. Just incase, here's a run down from our in-house interior stylist on how lighting can affect your home. Be sure to select the right style of lighting for your space. 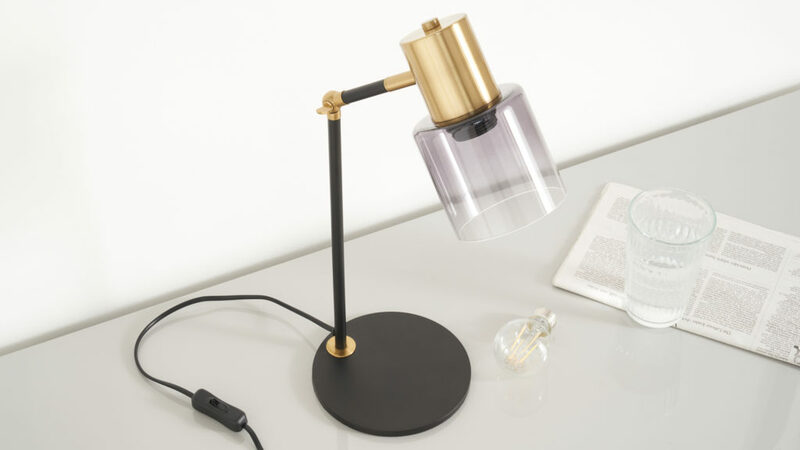 Task lamps work great in home offices, pendants in hallways and kitchens and table lamps as bedside lamps. 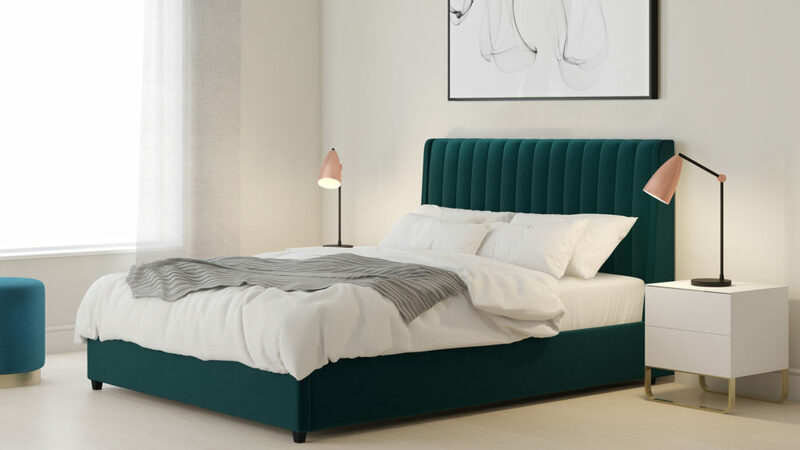 The Flo Table Lamp brings style and colour to your bedroom. Consider your personal style before selecting your lighting. Modern homes call for clean, simple lines. Avoid overly fussy shades or vintage styles to maintain your signature style. Bulbs should not be overlooked. Know the wattage of your bulbs and make sure you're using them correctly. 80W should be used for task lighting, whereas 30W is more than enough for relaxation zones. Choose styles which will not date and are not too "trend" based. 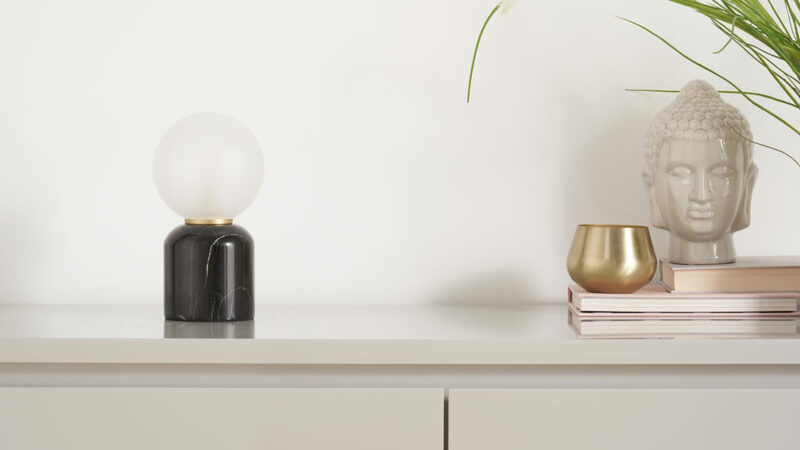 Tassle lamps may be big now, but in a couple years time, your simple marble lamp will be much more versatile than that hot pink velvet number. You can never have too many lamps. I have 6 lamps alone in my living room, each a slightly different style and giving off a slightly different light. This helps to create enough light to see efficiently, but not so harsh as to stop us from relaxing. The Carmel Lamp creates a tranquil zone for those dark winter evenings. 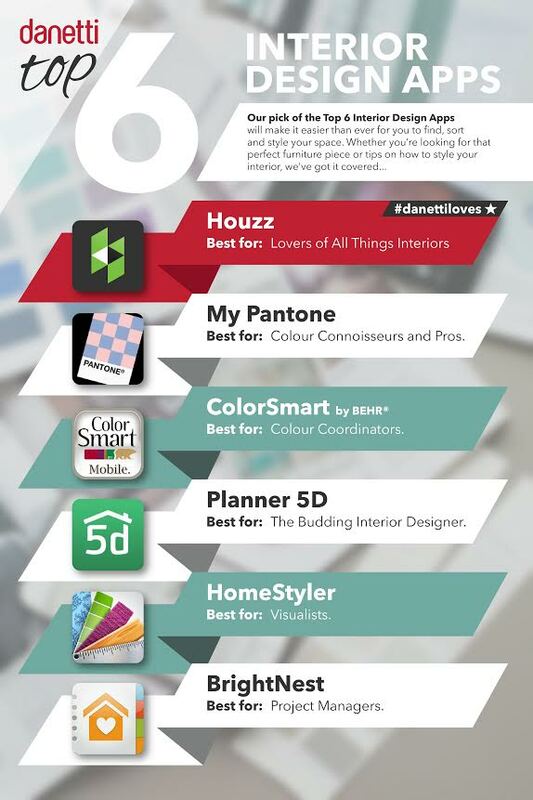 We love seeing your beautiful homes so don't forget to tag us on Facebook and Instagram with #mydanetti. When it comes to creating an open plan area of your home, it's really important to think about the layout. We want to avoid any clear walkways from one end of the room to another. Although it may feel natural to place your furniture around the edges of your room, mix things up and place a table in the middle! This will make you walk around the furniture. By simply placing furniture in the middle of a walkway you tie the room together and make a larger space feel cosy and filled. Our customer, Lizzy, Has renovated her 70's home to a modern and crisp family home. They created a huge open plan living/dining space, with the focal point being this stunning kitchen featuring the Verona Barstool. 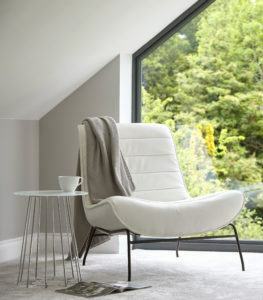 By sticking to a simple grey and chrome colour palette their home feels seamless and warm, despite being very open. 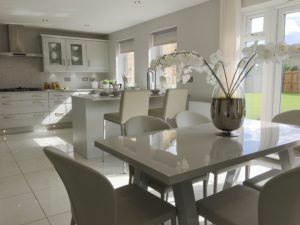 Kitchens work so well as open plan living spaces, due to the furniture naturally found in a kitchen. Kitchen islands, tables and dining benches are great pieces to use to separate the dining from the cooking. 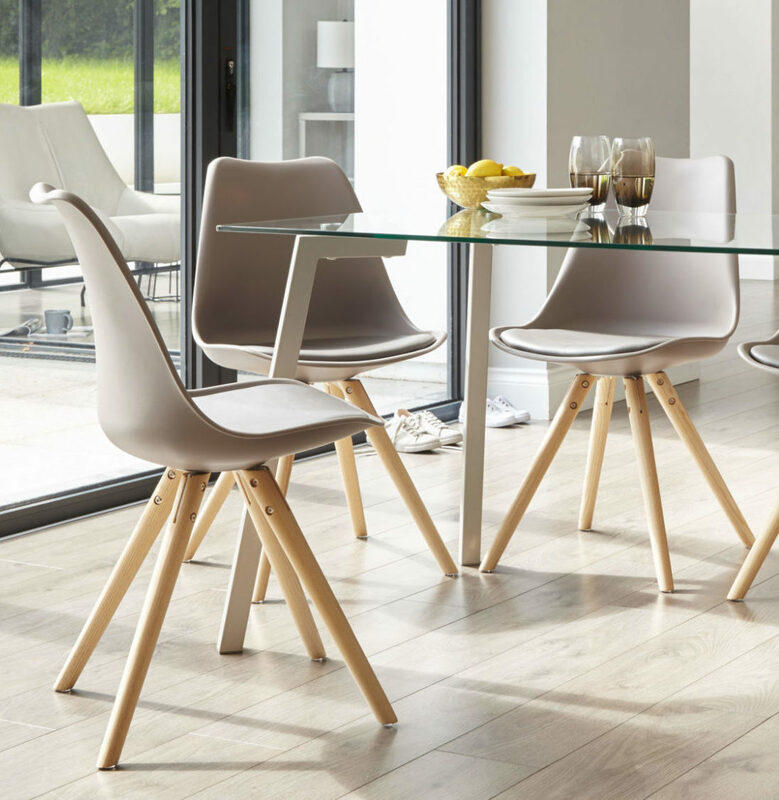 Top Tip: Glass Dining Tables are a great option for open plan living space. 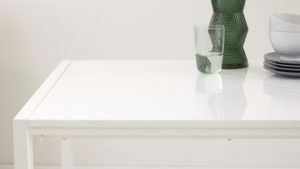 The clear table will allow more light to fill your space, keeping your home light and airy. A kitchen Island will help bring the cooking area to the dining area. 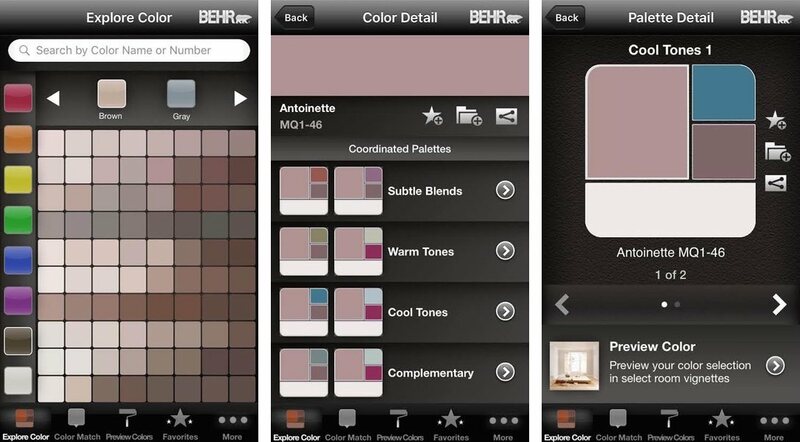 Choosing a different colour/wallpaper in each area will help create a feeling of different rooms. 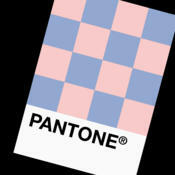 Be sure to choose a simple colour palette to keep things harmonious. Avoid painting the kitchen green and the dining space purple as this will be too much contrast and create an unharmonious feel. Add pendant lights over a table or island to create a 'wall'. This height will help break up your space all the while marrying the two areas together. Use the same style throughout the space. 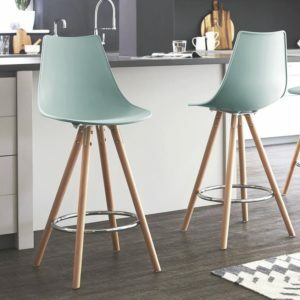 If you have Velvet Barstools, choose Velvet Dining Seating too. Sticking to a scheme will help make the room feel tied together. Think about height. 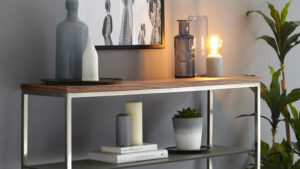 Floor lamps or tall shelving units will help add height and a point of difference in your home. Using furniture which is all one level will make your home feel flat and uninspiring. Adding height adds interest. It's not just kitchens which work well as open plan living areas. You can create an open plan kitchen/living area, or maybe a home office combined with a living room. No matter what you use your space for, by following the above tips you can easily create any open plan living space. 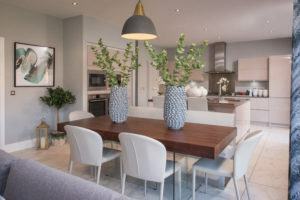 If you're feeling super adventurous, why not have a fully open plan kitchen, dining, living area? This may take a little more thought and planning, but by spacing your furniture well and sticking to a cohesive colour scheme, you can create a truly beautiful home and become your own interior designer. If you'd like to go back to basics, take a look at how to become your own interior designer. Where we walk you step by step through the basics of decorating your home without forking out for a professional interior designer. 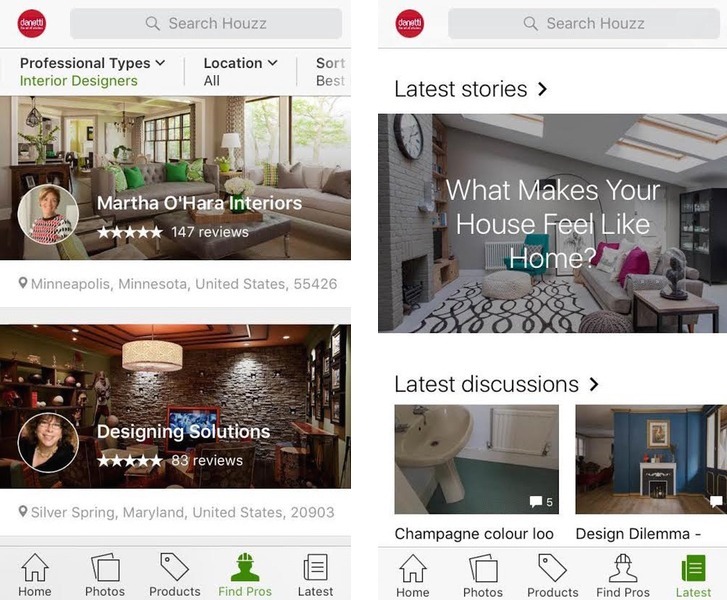 Have you recently re-designed your home? Don't forget to tag us on Instagram and Facebook using #mydanetti. To view all the pieces listed in this post and more, head over to our website. So you're finally in your new house, however, the dated decor leaves little to be desired. You're thinking to yourself "it's going to take a qualified interior designer to sort this place out". There's no need to fork out for an interior designer when you could quite easily do it yourself! Plus, you'll have great fun along the way and learn a few new skills. 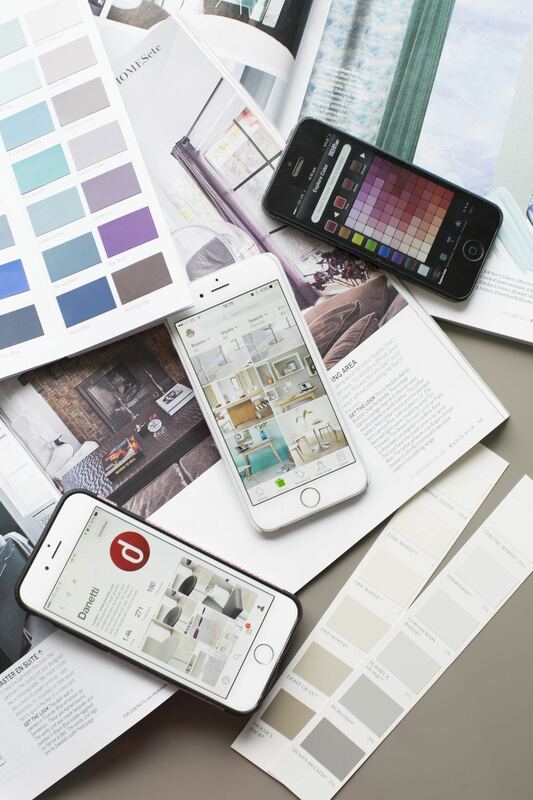 Follow our ten steps and you'll be well on your way to creating the home of your dreams. The first thing to do is to focus on what you like to do in your home. Think about how it gets used, or how you would like to use it. Perhaps you'd like a cosy TV and games room for the kids or a quiet spot where you can sit and read. This may require a bit of re-configuring but that's why creating your dream home is all about. It's all these considerations can form a 'Wishlist'. Your wishlist will end up being very similar to a brief that you would give to an interior designer, so it's a good place to start even when you're doing it yourself. Create a Pinterest board of looks you love and details you would like to incorporate. Don’t just take inspiration from the internet, though. Get out and about, visit art galleries, beautiful shops, friends homes and restaurants and take snaps of the areas which really catch your eye. Remembering these places and ideas can help you understand how form, texture, colour, scale, lighting and space can be combined to create something you like. Try to bring out the best in what you already have and work with it. What are its best features? Perhaps it’s a beautiful fireplace, an incredible view or a high ceiling? Accentuate these features with lighting and furniture arrangement to create a dramatic focal point. If you have a modern house, there's no point trying to make it ornate or trying to create a 'heritage' look. You have been blessed with a blank canvas to create the modern home you've always envisioned- be it glam, or minimal. 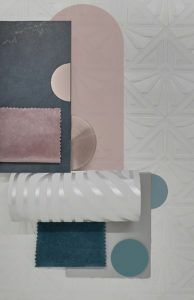 Although it's tempting to get carried away with thoughts of the fun stuff like wallpaper and soft furnishings, you really need to think carefully about the basics first. 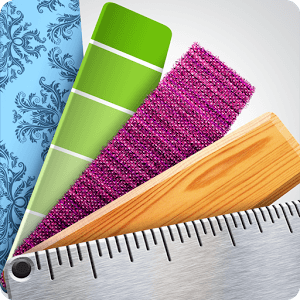 Create boards of flooring, tiles, wallpapers and paint samples to make sure you're happy with your chosen colours and finishes. Once you have the basics figured out, the little details will simply fall into place. Just because you like the look of a piece of furniture doesn't necessarily mean it will look good in your space. 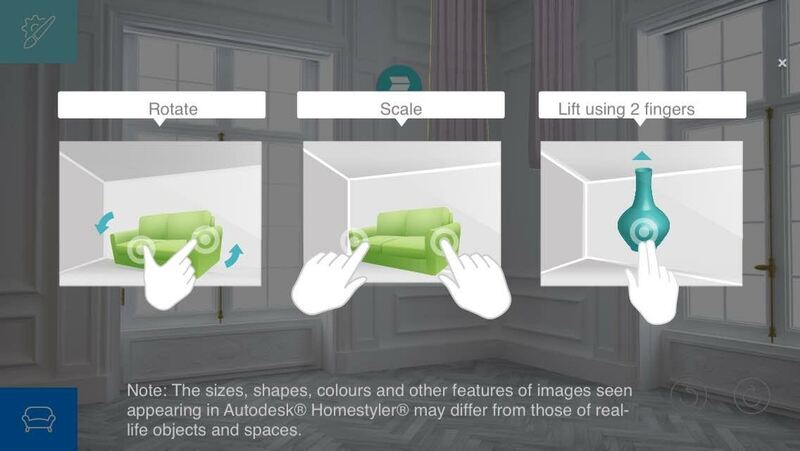 Make sure you always measure your room before investing in furniture. 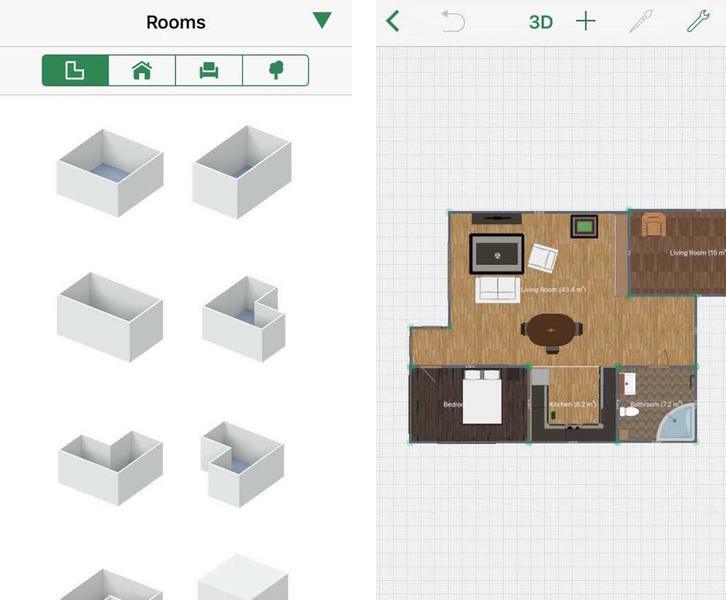 To really make sure there are no errors, draw out a plan of the room to scale on squared paper. Then you can draw in the furniture so you can see exactly how it will look. At Danetti we make this easier, by always providing full measurements for our products. It's also worthwhile measuring your doorways and stairwells - the last thing you want is for your furniture to arrive and then not to fit through the door! Too many people isolate one room, give it a certain vibe and colour scheme, and then chose something totally different in the room next door. Rooms shouldn't all be decorated the same, but it does help if there is some harmony. This is a particular skill of an interior designer, but it's a useful habit to get into. You want your living spaces to be vibrant and energetic, such as kitchens and playrooms, but keeping your resting rooms more subdued, like your living room and bedroom. Stick to a harmonious colour palette and a similar style throughout. The best part of this is that your furniture should then be interchangeable between rooms. 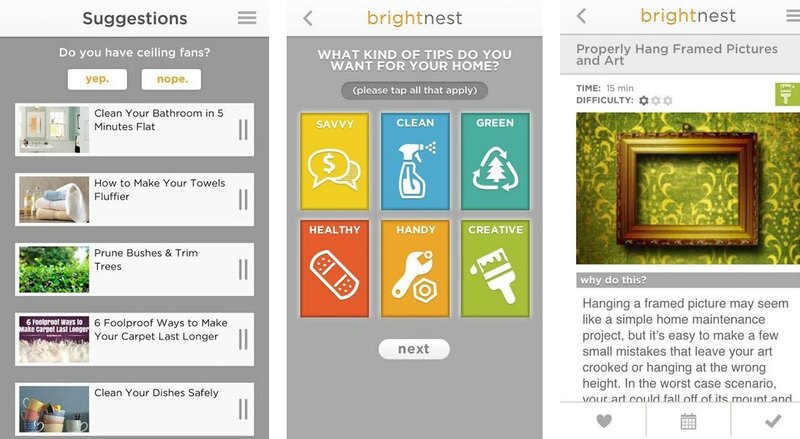 Meaning you can refresh your home whenever you see fit with things you already own. In most modern homes spotlights are the preferred option. They are great as they distribute light evenly across a room and don't get in the way. However, they can be quite harsh in the evenings and don't offer much character. If you have spotlights, think about adding a few tasteful lamps to your home. these will give out a softer light and promote a more relaxed home. Where possible use your pendant lights to create a statement or a focal point. This could be a cluster of low hanging pendants over a dining table or a beaded chandelier in a grand entranceway. Lighting will create mood and give a space personality, so be sure to give it some consideration. You don't want to run out of money halfway through a renovation project, so set yourself a budget and stick to it. 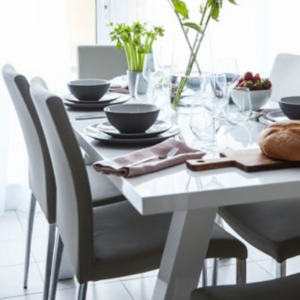 Some things are worth investing in, such as flooring and your larger furniture like sofas and dining tables. 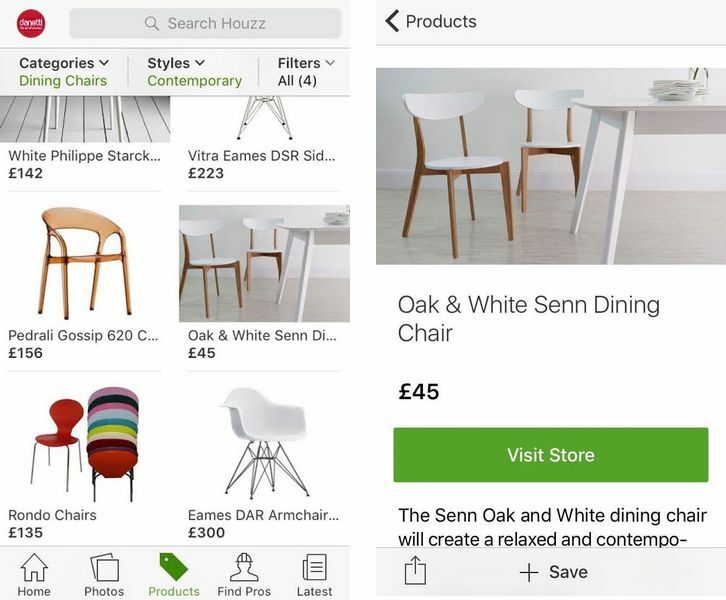 Where trends change so frequently there is no point spending hundreds on your soft furnishings and decorative accessories. These smaller trend items are more cost effective so buy what you like, but don't spend the earth as you'll probabley be bored after a few years! Remember when spending on any electrical appliances and gadgets that new technology soon becomes old technology, so it's probably not worth spending that much on the latest fad- do your research and invest in timeless items. Before committing to a tradesman, be sure to have done your research, have a few recommendations and get a few different quotes. You should also ask for references and ask to see their previous projects. If they are good, then they shouldn't object. It's useful to put your objectives in writing, as this can be a useful document fall back on if things do not turn out as expected. Builders don't have the same artistic vision as interior designers, so be sure to keep a close eye and communicate every step of the way- too much communication will be better in the long run and save any unwanted surprises! Sometimes your creativity may run dry, and that's ok! Being innovative and artistic all the time isn't easy. Look to those who inspire you and maybe ask for help or advise. 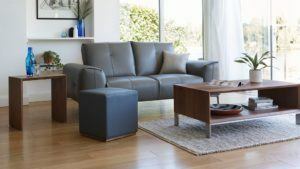 Independent furniture retailers such (like us here at Danetti) are very familiar with the process of furnishing a home successfully. We would be more than happy to help you find the pieces that will work well together and bring out the best in your home. Just give us a call and we will happily suggest a few beautiful options. 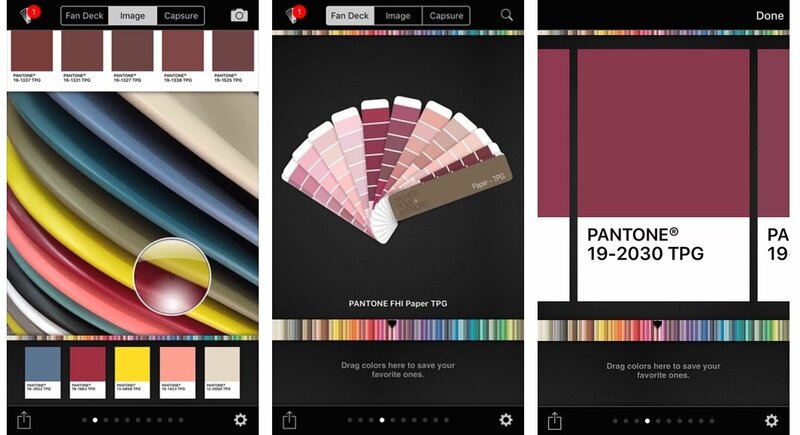 Don't forget to follow us on Facebook and Instagram for Interior Inspiration. Use #mydanetti to tag us in your photos to be featured too! The world of interiors is always evolving. In this day and age, there is a focus on practical, technical, modern living. However, trends come and go, then come back again. For example, we're beginning to see more and more Art Deco elements being re-introduced into our homes. Art Deco styling is an elegant way to bring a welcome collaboration of modern day living and the timeless style of the bygone era. 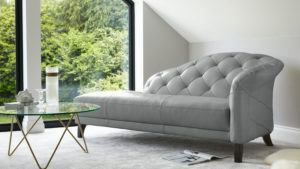 We've teamed up with Good Homes magazine Editor, Karen Walker, to discuss this Art Deco resurrection and to show you how to bring Art Deco Glamor into your Modern Home. What Defines Art Deco Style? Focus on Shapes: Be it curves, geometric shapes, or a combination of the two, Art Deco is all about the structure of shapes. Metallic Details: With pops of brass in tiles, lamps and hardware and wallpapers, Art Deco is incomplete without a touch of metallic. 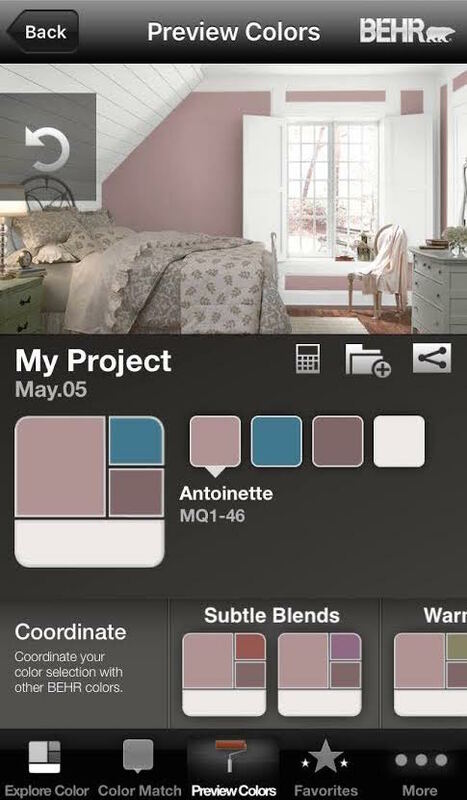 Soft, Muted Colour Palette: Combine muted pinks, blues, greens and balance with bold blacks or navy. Oversized Details: Oversized lamps, artwork and furniture is a key sign of Art Deco Interiors. Luxury Textures: Velvets, leathers, feathers and furs are all seen in Art Deco interiors, bringing an air of luxury to your home. Our first Art Deco look is one full of texture and colour. Start with patterned, paintable wallpaper. 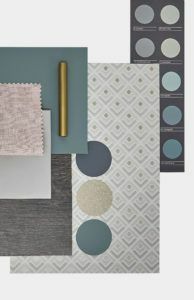 This will bring the Art deco style, but allow you the freedom to colour-match to your existing interior style. Cold black granite blends beautifully with soft pink Velvet and Metallics, creating a softer overall look with a harder edge. When it comes to your furniture, choose curvacious shapes that will create a juxtaposition against the angular, geometric wallpaper. 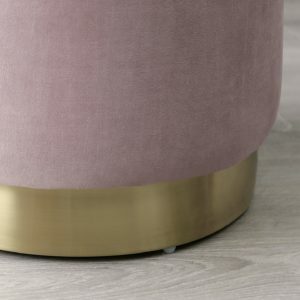 The cylindrical shape of the Plaza Stool in Blush Velvet and Brass sits beautifully against the angles of the Sanza table, all the while clashing the Brass against the Stainless steel of the base. Mixing and matching soft leather and gloss finishes reaffirm the contrast of this Art Deco style, whilst creating a modern interior suitable for any home. Add a touch of steel blue to prevent this look feeling too feminine. 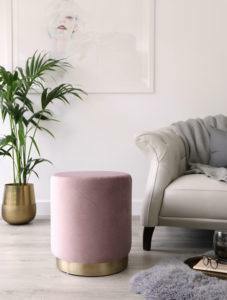 Stylist Top Tip: Be sure to introduce extra colour and metallics in your soft furnishings, such as brass picture frames and the odd blush pink or blue cushion or object. 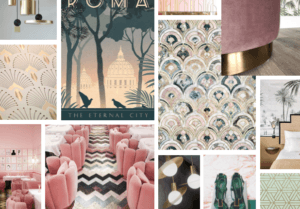 When putting together this mood board I had in mind a restful and sophisticated scheme, perfect for unwinding on a quiet evening or a relaxing setting for entertaining guests. 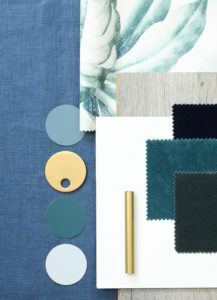 Serene colours are combined with an interesting mix of materials, from gloss and natural wood to linen and natural fibres. The Halo coffee table has a sleek appearance, and when paired with a muted colour palette and dark flooring, it can take centre stage. Soft teal and sage green are great colour choices for walls, as they act as both a nature-inspired neutral and an injection of colour. Combine with a subtle pattern, like this small scale geometric wallpaper - it has hints of metallic, adding a touch of glamour without overpowering the scheme. Karen's Top Tip: Mixed metallics are set to be a big trend in 2018, with metallic paint becoming increasingly popular. So why not complete this look by painting picture rails and architrave details gold to match the wallpaper? Create visual impact by contrasting materials; textured fabric works surprisingly well against gloss furniture, as it helps the eye to travel around the room. Use pink as your accent colour by pulling out a few accessories and soft, tactile furnishings to complete the look. Opt for blush pink linen upholstery that, when offset against the calm background, will set a romantic mood. For the finishing touches, consider bringing in accessories with reflective surfaces, as these will bounce light around the room. When used in careful moderation, glass, metallics and mirrors will combine for a luxe finish. Our final Art Deco look is one more suited to rented accommodation or those after a quick home update. Rather than focusing on the glitz and glamour of Art Deco, this story takes on a subtle, modern look, with a nod to Art Deco styling. The focus is on texture and a simple colour palette with the odd hint of metallic and shape. This makes it an ideal look for homes which cannot be easily updated with current interior trends. 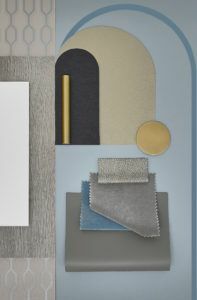 This board plays off the muted colour palette of greys, pale blues and a touch of brushed brass. Brushed brass is much softer than those with a reflective finish. 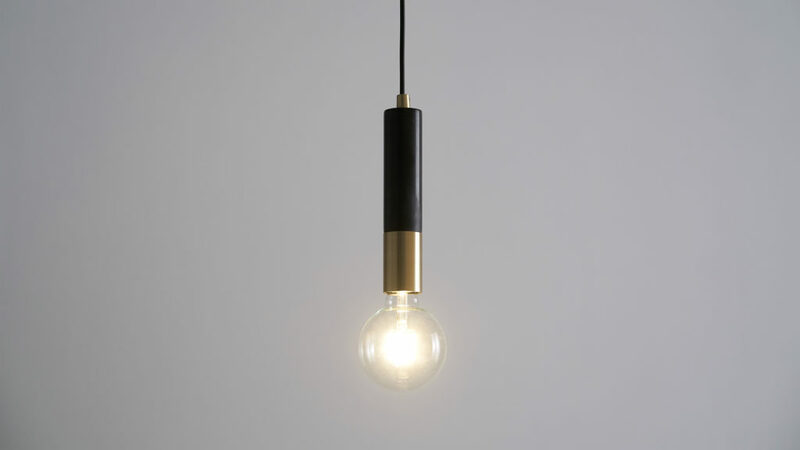 In turn, this offers a more subtle look with all the class and warmth of classic brass. Mixing velvets with textured leathers is a key feature of Art Deco styling. However, keeping the colours more complementary keeps this look more commercial for everyday modern homes. Ground the pastel shades with a hint of black to keep this look modern. 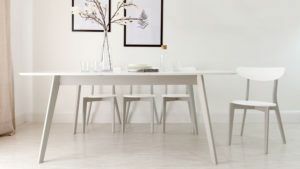 Choose a high gloss extending dining table, such as the Metro, with a simple silhouette. Using colourful chairs will bring in a more playful touch, too. 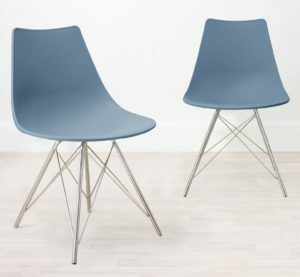 Try the Stylo Dining Chair in Steel Blue to keep this Art Deco colour palette clean. What's more, balancing matt and gloss finishes with soft leathers will make your home look as though it's had an interior designer's touch. Let us know what you'd have in your dream Art Deco interiors, and if you try any of these looks for yourself, don't forget to tag us in your pics of Facebook and Instagram! We want to let you into a little secret… If you are giving your living or family room a makeover, here’s one of the simple tricks that Interior Designers use to ‘pull together’ a living room scheme. To create an effortlessly co-ordinated and stylish look they suggest having occasional Console, Side, End and Coffee Tables which match or blend with each other. They don’t need to be exactly the same style but perhaps they all have something in common, for instance the same clear glass tops, or funky chrome legs. Then as a finishing touch, accessorise each table in a similar way, with matching photo frames, table lamps or similar ornaments to give a totally co-ordinated, sophisticated style. The Naturale Washed Oak Console Table can create a stunning first impression for guests as they step into your hallway, or can be a useful occasional table in your living room or dining room. A versatile piece of furniture which completely stands out from the crowd! The unique and hand selected oak used in its manufacture has been lovingly dried and finished with a subtle white wash to bring out the natural tones and beauty of the oak. The Naturale Washed Oak Console Table has two soft close drawers for storing bits and bobs, and a handy shelf underneath. It measures 1100mm in height, 850mm in width and 400mm in depth. This modern console table looks fabulous with other matching items from the Naturale range, including the matching Side and Coffee Tables. The Naturale Washed Oak Side Table is part of our new and stylish Solid Oak range and matches the larger Naturale Washed Oak Coffee Table and Console Table perfectly. 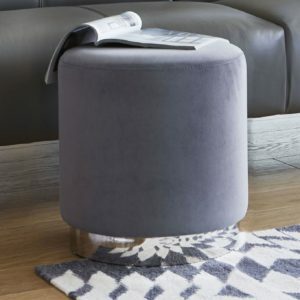 This modern square side table is ideal for use as a Lamp Table or End Table beside a sofa. Every item in our Naturale Washed Oak Furniture Range is unique and individual due to the solid oak used in its manufacture. Each piece of timber is hand chosen, carefully kiln and air dried to preserve and enhance its natural beauty, before being given a light white wash to give a contemporary and sophisticated finished look. 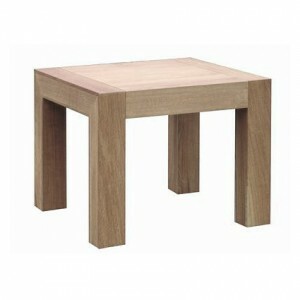 Take a look at the other Naturale White Washed Oak items for a totally co-ordinated look and style in your home. 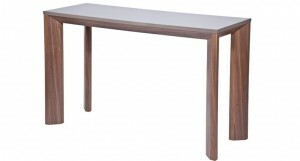 The stylish Taranto Walnut Console Table would look beautiful in your home and is a very versatile piece of furniture. It can be used in your living room, hallway, dining room or kitchen. The Taranto is a unique Console Table with a warm, classic Walnut Frame that has a tactile feel. The stylish Walnut Frame supports the elegant Dove Grey Lacquered Top which complement each other perfectly. 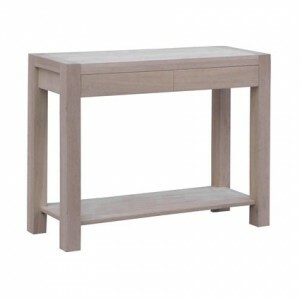 This contemporary Console Table has a length of 1200mm and a width of 450mm. If you are looking for a unique and stylish wooden coffee table that will stand out in your living space then the Taranto Walnut Coffee Table is the one for you! 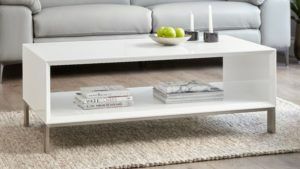 The modern Taranto Coffee table is a stylish addition to your living room. Its stunning Walnut frame creates warmth and a natural look that is sure to warm up your living space. The Dove Grey Lacquered Top contrasts with the rich, classic Walnut frame and matches the Taranto Walnut Console Table perfectly. 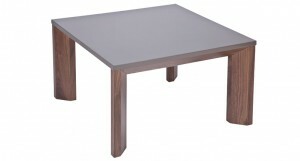 This contemporary rectangular coffee table has a length of 1400mm and a width of 700mm. The Solero Glass Console Table is a very versatile piece of occasional furniture. 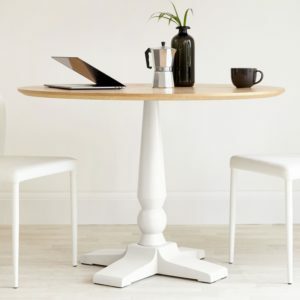 It can be used in a variety of ways, as a console side table in a living room, a handy table in the hallway or even as a small desk in the lounge or study. The clear glass top is set upon two squared loop legs finished in modern shiny chrome to give a stylish and light reflecting slimline console table. The modern Solero Glass Console Table measures 760mm in height, 400mm in width and 1100 in length. 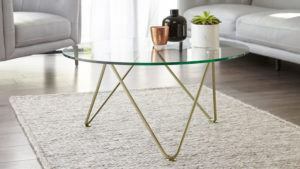 Matching the trendy Solero Glass Console Table, we have a handy and stylish set of three modern glass occasional tables that nest inside each other. 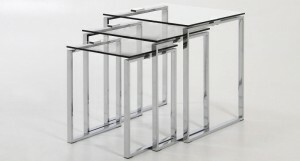 This elegant nest of tables have contemporary clear glass tops set upon rectangular chrome loop legs. Elegantly simple, these side tables will add style and sophistication to any living area. 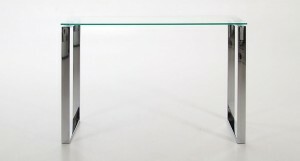 A sleek and stylish clear glass and chrome TV Table. The clean lines of the glass shelves and square chrome legs have a modern and understated feel. The shiny surfaces of the glass shelves and chrome legs make this a light and very versatile tv stand which will look great in many types of modern setting. 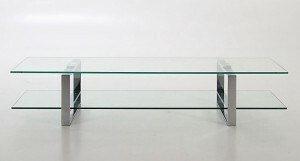 The Solero Glass TV Table is 1600mm in width, 450mm deep and 320mm high. Taken from the art form minimalism, the Japanese highly influenced the creation of minimalistic design through their traditional style and architecture. The design is simple - reduce everything down to its necessary elements. I wonder how many homes have unnecessary elements? With our hectic lives, I'm sure many of us have objects in the home that we just don't need. But can you imagine the satisfaction and fulfilment if the only things on our kitchen worktop where the bare essentials such as a kettle and toaster? How calm and relaxed would you feel knowing that everything was in it's rightful place and the area looked clean, clear and spacious? Well, we can help. 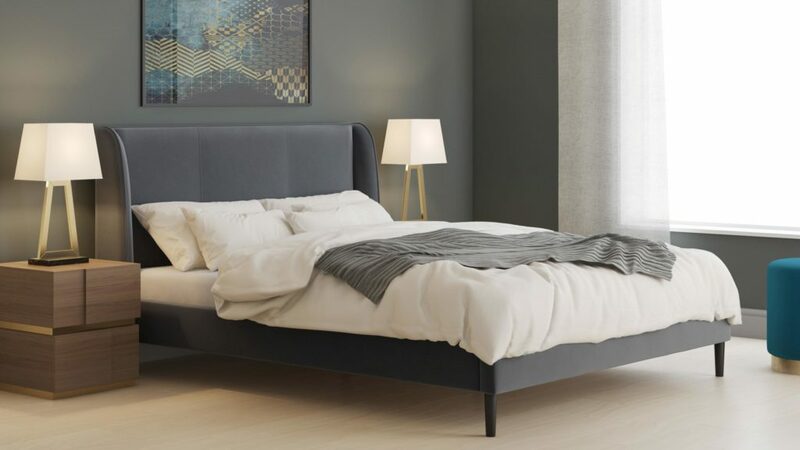 From the kitchen to the bedroom, in this guide, we tell you all you need to know to help you create a minimalistic home. So you can feel less stressed and take pride in your home. Always start planning your room with the key furniture items. Remember that less is more, so always try to see the functionality of the item. If it has no purpose and is never used then ask yourself is it truly essential. I would advise people to go for a few choice pieces of plain and simple furniture with subdued colours, decorative items beyond the essential can always be added later on. See the images below for achievable ideas to incorporate into your kitchen, dining room and living room. 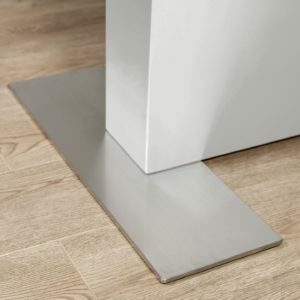 This means floors, surfaces and walls - make sure that all clutter is out of sight. Nothing should be stored on the floor or stacked. Try to buy furniture that has maximum storage. Surfaces should be removed of all items apart from one or two decorative accessories. Remember that when choosing wall art, it is important to only have one or two simple pieces as lots of pieces can make the space feel smaller. Always try and leave some walls bare. 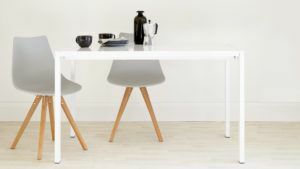 White is the classic minimalistic colour but other subdued earth colours can work too, such as blues, greens and browns. Avoid big and bold patterns such as flowers and checks as these can create visual clutter! Liven up any plain colours with simple decorations. A vase of flowers or a selection of candles can add interest without adding clutter. And Finally..... Keep it up! It is important you find a place for all clutter and remember where that place is. Every so often have a look at the space and see what items are unnecessary. Remember a minimalistic home is a less stressful one!